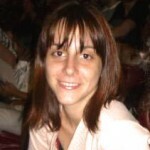 Gina Granja Galeano, born in 1988, is a Biochemist graduated from the Universidad de Buenos Aires. She has a CONICET scholarship and is developing her doctoral thesis at the LABORATORY OF RECEPTORS’ PHARMACOLOGY under the direction of Dr. Federico Monczor and the co-direction of Dra. Ana Franchi. Her thesis project studies the cross-talk between the glucocorticoid receptor and the type 1 cannabinoid receptor, and its implications in the consolidation of associative memories. In her free time, she likes to practice aerial acrobatics and to cook.